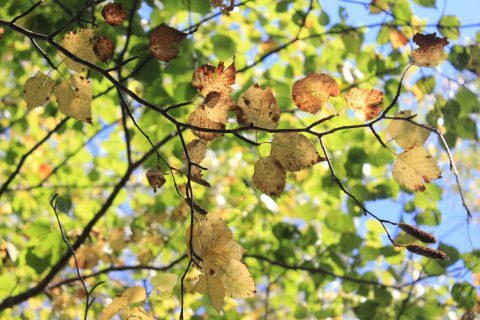 Though the sultry summer of 2018 is still fresh in our memories, it would seem that autumn is well and truly here. As of September 18th, morning temperatures hovered around 12 degrees Celsius, climbing to a peak of 17 at midday. That in turn marked a shift from ten days earlier when you might expect 16 degrees in the morning and 18-20 by noon. The writing’s on the wall folks: it ain’t getting any warmer. 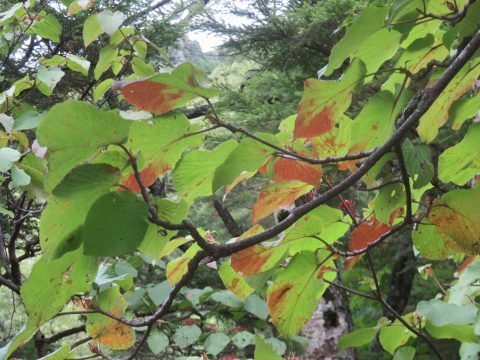 At present, we’re only seeing the first splashes of color on leaves. 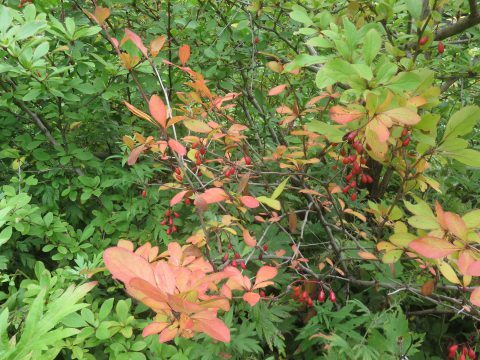 The pictures above show an Amur barberry shrub (top) and a forked viburnum (second from top), both photographed near the Shimizu River. As you can see, they’re not completely yellow yet. So in summary, we won’t be seeing broad swathes of color on the trees for a while yet, though by mid-to late October you can count on some impressive scenes. Visitors enjoy a tranquil riverside moment amid light rain. 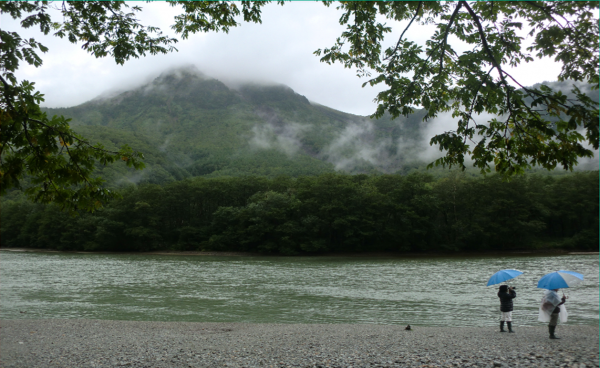 The popular Japanese language mountaineering site Yamakei Online reports that the foliage in Karasawa is still in its early stages (think 10 to 20 percent of peak colors), but that this should improve by the end of the month. Karasawa Hyutte’s homepage offers similar info with pictures you can see by following the link below. Having visited Karasawa in mid-September several years ago, I can tell you that it gets crowded at this time of year. Reservations for tatami space and tents at the lodges are at a premium, so planning ahead is recommended. That’s all for now. We’ll be back with further updates when we have more to report. Oh, thanks again to the hard working, devoted, and knowledgeable bloggers at National Park Guide for providing valuable info and images!